Sen. Amy Klobuchar, Maureen Dowd, FCC, FTC Commissioners Join Power Women Breakfast Series in Washington D.C.
TheWrap Power Women Breakfast expands to Washington D.C.
TheWrap’s Power Women Breakfast series expands to Washington D.C with feature speakers, Senator Amy Klobuchar of Minnesota; Maureen Dowd, columnist for The New York Times; Elisabeth Bumiller, Washington Bureau Chief of The New York Times; Adrienne Elrod, Director of Strategic Communications and Surrogates for the Hillary for America Campaign; Commissioner Julie Brill of the Federal Trade Commission and Commissioner Jessica Rosenworcel of the Federal Communications Commission. The March 10th breakfast is hosted by TheWrap’s CEO and Editor-in-Chief, Sharon Waxman; SVP of Industry Alliances of Box, Founder of Box.org, Karen Appleton; CEO of CreativeFuture, Ruth Vitale; CEO and President of Heather Podesta + Partners, Heather Podesta and President and CEO of Personal Care Products Council, Lezlee Westine. The series brings together influential women of entertainment, media, technology and brands in key cities to network and connect. TheWrap has built a broad community of professional women who are decision makers and mothers, leaders and wives, innovators and activists. Each event brings inspiring speakers to talk about issues that relate to top women influencers. The franchise is now in four cities Los Angeles, New York, San Francisco and Washington D.C. Senator Klobuchar is the first woman elected to represent the State of Minnesota in the United States Senate. 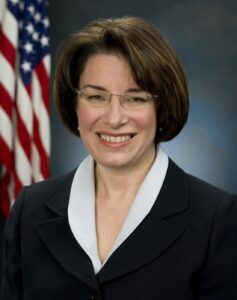 Senator Klobuchar is Chair of the Senate Democratic Steering and Outreach Committee, a Ranking Senate Member of the Joint Economic Committee and the Judiciary Subcommittee on Antitrust, Competition Policy and Consumer Rights. She is also a member of the President’s Export Council and the Senate Commerce Committee. Dowd is the winner of the 1999 Pulitzer Prize for distinguished commentary and author of two New York Times bestsellers, “Bushworld” and “Are Men Necessary? When Sexes Collide.” She became a columnist on The New York Times Op-Ed page in 1995. Dowd has covered seven presidential campaigns, served as the Times’ White House correspondent, and wrote “On Washington,” a column for The New York Times Magazine. Bumiller is the Washington Bureau Chief of The New York Times, where she oversees the paper’s coverage of the nation’s capital. She was a Times Pentagon correspondent from 2008 to early 2013. In 2008 she covered the presidential campaign of Senator John McCain. From Sept. 10, 2001 to 2006, she was a Times White House correspondent who also wrote a weekly column, White House Letter, about the people and behind-the-scenes events of the presidency. 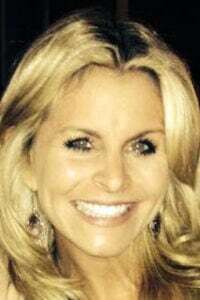 Adrienne Elrod is a seasoned political strategist with over 17 years of experience in government, communications, and campaigns. Currently serving as Hillary for America’s Director of Strategic Communications and Surrogates, Elrod oversees the Clinton Campaign’s wide-ranging surrogate operations, deploying elected officials, civic leaders, and celebrities all across the nation who help bring Hillary’s message to life. 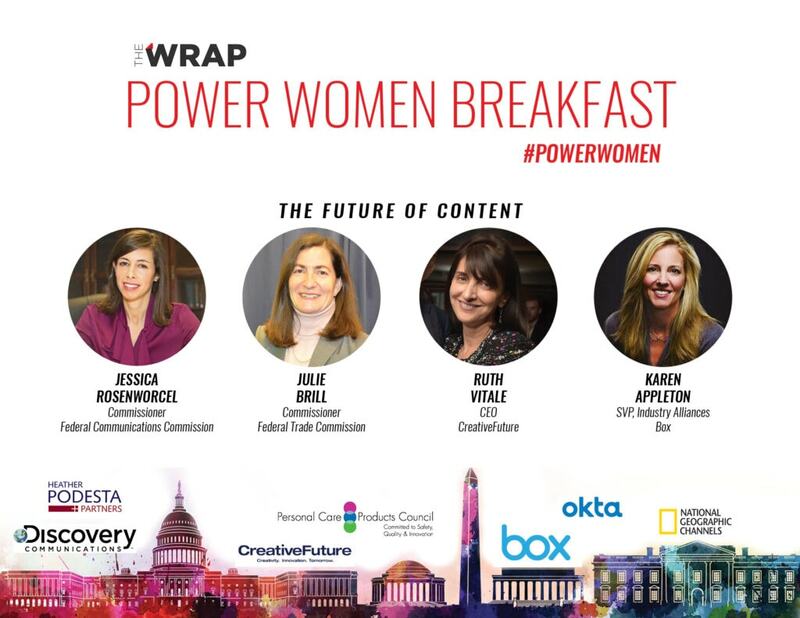 Speaking on a panel discussing the Future of Content with be Commissioner Rosenworcel, Commissioner Brill, CreativeFuture’s Ruth Vitale, Box’s Karen Appleton and moderated by TheWrap’s Sharon Waxman. Commissioner Rosenworcel brings a decade and a half of public and private sector communications law experience to her position at the FCC. This experience has shaped her belief that in the 21st century strong communications markets can foster economic growth and security, enhance digital age opportunity, and enrich our civic life. Commissioner Brill has been working actively on issues of critical importance to today’s consumers, including protecting consumers’ privacy, encouraging appropriate advertising substantiation, guarding consumers from financial fraud, and maintaining competition in industries involving health care and high-tech. Appleton leads Box’s vertical industry go-to-market team, responsible for creating ecosystems of customers and partners, and developing transformational solutions that address major opportunities for enterprises. Karen is the founder of Box.org, delivering Box to thousands of non-profits globally to make tech tools accessible and available. Vitale has been at the forefront of independent film production and distribution for more than three decades, including as Founder and Co‐President of Paramount Classics and as President of Fine Line Features. Previous speakers at TheWrap’s Power Women breakfast series include Academy Award-winning actress Helen Mirren, comedian Chelsea Handler, Game of Throne’s actress Emilia Clarke, activist-actress Salma Hayek, producer and entrepreneur Gail Berman, California Attorney General Kamala Harris, media executive Nancy Tellem, digital executive Susan Lyne, technology journalist Kara Swisher and many others. The event is sponsored by Box, Okta, Personal Care Products Council, CreativeFuture, Discovery Communications and National Geographic Channels. 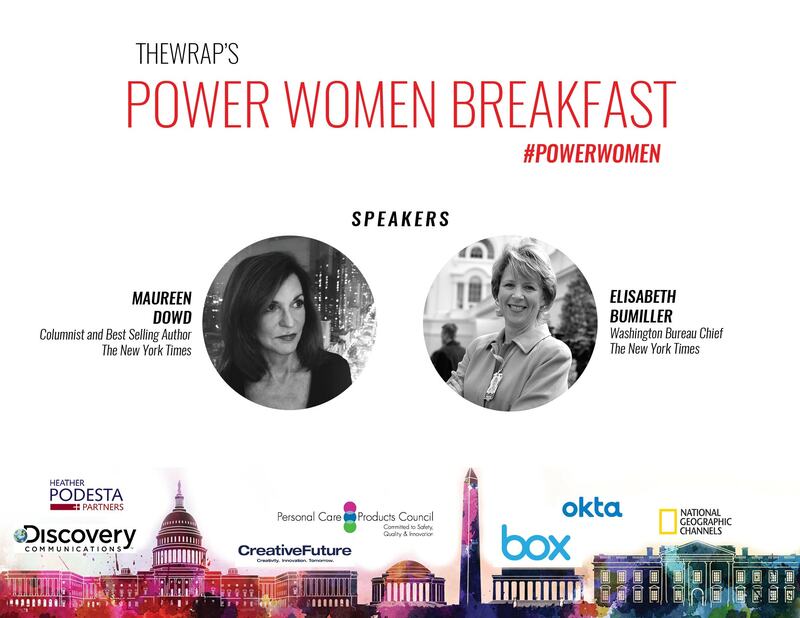 TheWrap will live stream TheWrap’s Power Women Breakfast Washington D.C. Exclusively on Facebook Live! Head over to FB.com/TheWrap to watch the breakfast and speakers exclusively on our Facebook page.